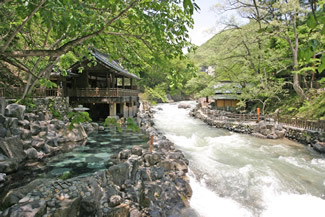 Gunma offers many onsen hot spring resorts to its visitors. Of these, Takaragawa Onsen is popular among foreign guests. Their Rotenburo, or open-air baths are the reason for this popularity. The onsen became the setting of a very popular 2014 movie called, "THERMAE ROME", starring Hiroshi Abe, an Arnold Schwarzenegger-type Japanese actor. What makes Takaragawa Onsen stand out in the crowd is their four very large open-air baths situated along the river deep in the mountains.